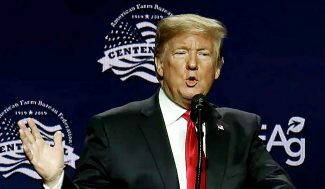 NEW ORLEANS — In a speech to the American Farm Bureau Federation on Jan. 13, President Donald Trump intensified his campaign to push Congress to pay for a concrete or steel wall along the border with Mexico, but he did not mention the idea of declaring a national emergency to gain access to previously appropriated funds to build the wall. "We are going to have a wall, we are going to have a barrier," Trump said to the friendly Farm Bureau audience that was estimated at 6,000 people. Farm Bureau members seemed particularly thrilled that the president came back to the convention for a second year. Trump noted that when he spoke at last year's Farm Bureau convention in Nashville he had promised to come back for this year's Farm Bureau centennial. "We need that barrier," Trump said, adding that people, drones and censors will not stop people from "rushing" the border. Although most Farm Bureau members vote Republican and most of rural America is represented by Republican House members, Trump urged the attendees "to call your Democratic lawmaker to pass a bill to secure the border and reopen the government." The government remains shut only because Democrats will not vote to pay for border security, Trump said. Trump emphasized his view that the wall is a necessity by calling out of the audience an Arizona rancher, Jim Chilton, who has had problems with drug traffickers on his land. Chilton took the stage during President Trump's speech to support the building of a border wall. Coming to the stage for brief remarks, Chilton said, "Mr. President, we need a wall." Chilton said he has traveled all over the world and that the biggest wall he has seen surrounds the Vatican. Chilton asked House Speaker Nancy Pelosi, D-Calif. to explain why she considers the wall "immoral" when the pope and the priests in the Vatican have one. "They have a wall. Why can't we?" Chilton asked. Trump noted that some people say walls are medieval, but pointed out that the wheel was in use in medieval times and is still used today. When Trump walked in, the audience stood, but Trump asked the attendees to sit down so that they could give him standing ovations. He got one of his biggest standing ovations when he told the attendees that his commitment to a wall doesn't mean he is opposed to immigrant farm labor. "You need these people," Trump said, explaining he wants to make it easier for farm laborers to come into the country than it is today and that workers who have been in the United States 25 years and go home should not have a hard time getting back in. Trump mentioned the government shutdown only briefly, saying that the Agriculture Department is doing everything in its power to ease the impact on farmers. As is usual in his speeches, Trump recalled his success on election night 2016 and listed the policies that he believes have benefited farmers: the withdrawal of the Waters of the United States rule, the tax cut including a near end to the estate tax or "death tax," and passage of the farm bill. Trump also took credit for the current trade negotiations, saying that there will be so much demand for U.S. farm products that farmers will need to increase acreage. Toward the end of the speech, Trump praised Thomas Jefferson for negotiating the Louisiana Purchase, which included the city of New Orleans and a land mass that doubled the size of the country and "made our nation the greatest farm country" on Earth.